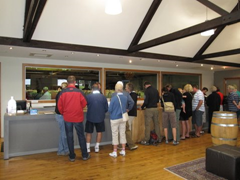 The bar at Cloudy Bay Vineyards, Marlborough, sits in front of wall of windows with a view of a cellar full of wine barrels. 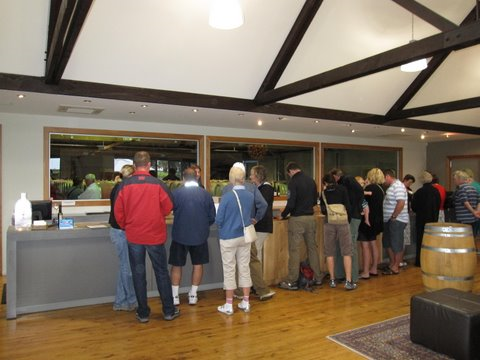 Cloudy Bay Vineyards cellar door/tasting room has a lovely casual feel to it. A long bar sits in front of large picture windows with a view of a cellar full of wine barrels. On the other side of the room, wall to wall windowed doors let lots of natural light pour in along with beautiful views of a large grassy area ringed by grape vines. Just outside, a concrete patio has several umbrella clad picnic tables which invite you to relax and linger on a sunny day. A basket full of toys makes families wine tasting with kids feel welcome and help keep the little ones busy while the grown ups get to taste some of Marlborough’s lovely wines. 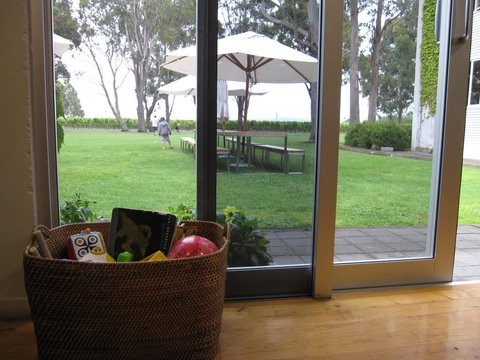 A basket of toys keeps kids busy while the adults taste the delightful wine at Cloudy Bay Vineyards, Marlborough. This Chardonnay-predominant blend of selected vintages was slightly fruity with a mild finish. It failed to wow us. 2006 Te Koko – Te Koko are Cloudy Bay’s wines which are fermented using only the indigenous yeast. This Sauvignon Blanc was really excellent, with lots of layers of fruit. $50NZD. This was definitely the highlight of the wine we tasted at Cloudy Bay. Unfortunately, their 2005 Riesling and Gewürztraminer failed to impress us.